Climate and its variations are estimated to have an effect of 10-20 percent of the trillion-dollar economy of the state of California. Changes in climate appear to be under way in the far West, and yet in years past there was no monitoring system in place specifically designed to detect and report on such changes as they unfold. The Desert Research Institute's Western Regional Climate Center, sponsored by the state of California and the National Oceanic and Atmospheric Administration (NOAA), undertook a project to identify gaps in how the climate of California is monitored, provide improvements in knowledge of climate in the state, and disseminate this information for public, policy, and technical use. This effort began with an evaluation of existing sources of data, locations of stations, and quality and type of information. This stage also involved consultation with state and federal agencies and with the climate research community. Significant partners include the California Department of Water Resources and the California Climate Change Center at Scripps. In such a vast state with so much climate diversity, the approach taken was to focus on selected clusters and transects, with special emphasis on regions with strong spatial gradients in climate and underobserved geographic settings. 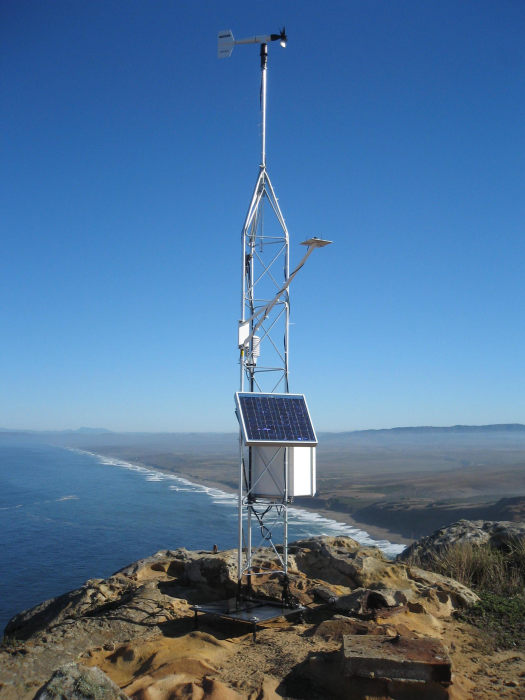 Mountains and coastlines received preference for new weather stations at the start. A transect has been identified that extends from the central coast to the North Fork American River and east of the Sierra Crest, including the Point Reyes location pictured here. Strong preference was given to locations not expecting development or changes in site characteristics (such as vegetation and land use) for several decades, and thus stable land ownership. Another priority was suitably open exposure. All sites have live communication, and all data is posted to the Internet and freely available. The weather stations are based on Campbell Scientific's CR1000, and typical measurements include temperature, precipitation, wind speed and direction, relative humidity, solar radiation, snow depth, and soil temperatures, from a tower usually 10 m in height. The project has been joined by many partners interested in fostering long-term climate observations in the state of California.